Our cut-end Microfiber Wet Mop will replace and out perform all traditional cut-end wet mops including cotton, rayon and blended yarns. 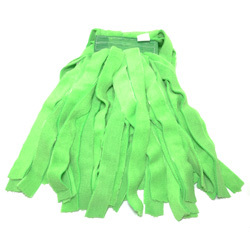 These mops are made with 100% continuous filament microfiber blended yarns. They are super absorbent, non-linting, bacteria resistant, require no break in period, super efficient to use and competitively priced against traditional cut-end wet mops. The microfiber yarn increases the surface friction for superior cleaning as compared to traditional wet mops. They are one of the best wet mop ever produced for commercial cleaning applications.